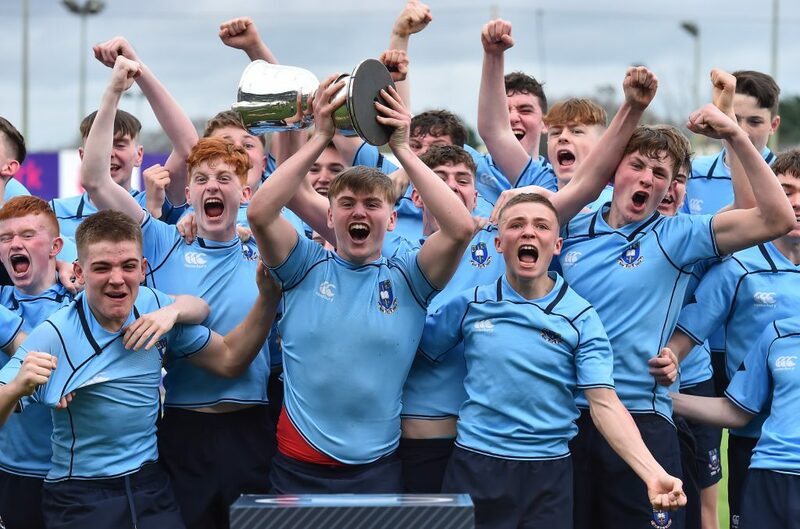 St Michael’s have beaten Blackrock College to claim the Bank of Ireland Leinster Schools Junior Cup and complete a historic double. Trailing with just four minutes remaining, the Ailesbury Road outfit blitzed Blackrock late on to claim the honours. Michael’s couldn’t have predicted this late drama after having a dream start. With Ethan Laing down receiving treatment, Blackrock failed to spot the open space on their right flank and were duly punished. Full-back Henry McErlean was quickest to spot the potential opening and clipped a delicate cross chip into the hands of waiting Tiernan Hurley. Hurley had the easy task of grounding the ball under no duress. Fintan Gunne’s conversion bounced back off the post. Both sides were forced into changes at 15 before the break with JP Tiernan and Charlie Leahy called upon to replace Henry McErlean and Ruben Moloney. ‘Rock levelled in the 12th minute when Liam Molony pulled off the back of a lineout maul to crash over the line, and the extras from Zach Quirke pushed them in front. They stretched that lead soon after when scrum-half Will Fitzgerald noticed a gap in the Michael’s rearguard. He dotted down in the corner leaving a difficult conversion attempt that was nailed by Quirke. There was just enough time left in the first half for Laing to show why he has been one of the star players of this year’s Junior Cup. The winger burst through the Michael’s line before racing around their last line of defence and diving in to touch down. Blackrock were clever in their game management at the start of the second half, Quirke in particular was excellent with the boot. However, they didn’t add to their lead and when Zach Baird got Michael’s second try, their support found a second wind. The relentless pressure from Michael’s was unbearable for ‘Rock fans and with every attack, they got closer and closer. Eventually, Egan’s try, converted by Fintan Gunne, in the 57th minute levelled matters. And that wasn’t the end of the late drama at Energia Park. A break from Egan in the final minute provided replacement David Fegan with the opportunity to win it. Gunne had the final say as his conversion sailed between the posts bringing down the curtain on an eventful Junior Cup final. Scorers – Blackrock College: Liam Molony, Will Fitzgerald, Ethan Laing try each, Zach Quirke 2 cons; St Michael’s College: Tiernan Hurley, Zach Baird, Sean Egan, David Fegan try, Fintan Gunne 3 cons. Blackrock College: Ruben Moloney (Charlie Leahy 8’), Cian Ryan, Hugh Cooney (Max Caskey 47’), Federico Mei, Ethan Laing, Zach Quirke, Will Fitzgerald; Cian O’Brien (Maxime le Bail 57’), Greg Barron, Paddy McCarthy, Samuel Green, Tom Brigg, Jamie McLoughlin (Maxwell Brophy 57’), Liam Molony, Gus McCarthy (capt). St Michael’s College: Henry McErlean (JP Tiernan 17’), Daniel Whelehan (Charles Foley 58’), Matthew Victory, Sam Berman, Tiernan Hurley, Killian McMahon, Fintan Gunne; Dan Barron, Matthew Sherwin, Sean Egan, Michael Sadlier, David Woods, Dan Carroll (David Fegan 46’), Josh Brown, Zach Baird (capt).